Place your Trading Stations and coins in front of you. Place the 4 Followers of your color on the Market Spaces of your Player Board. 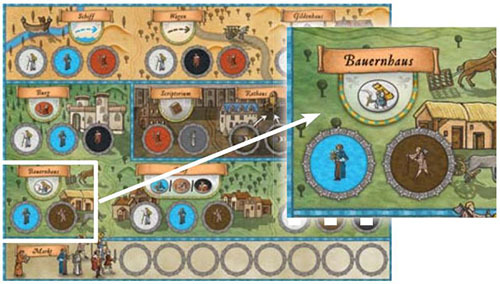 Place the large game board (places and terrain) and the "Beneficial Deeds" board on the table. Place the Technology Tiles in a stack on the appropriate space of the game board. Remove the "Pilgrimage" Tile (lighter hue) from the deck of Hour Glass Tiles, then shuffle the remaining tiles. Place the shuffled stack of tiles face down on the appropriate space of the game board and put the "Pilgrimage" Tile on top. The game will always start with the "Pilgrimage" event during the first round. Place 1 marker from each player on the first space of each of the Character Tracks as well as the Development Track. Sort the neutral Character Tiles (without the marking in player color) by profession and place them on the appropriate buildings on the game board. Put the coins on the table close at hand. Place 13 Citizen Tiles on the marked spaces on the game board and the "Beneficial Deeds" board. Put the remaining tile on the table. Sort the Place Tiles by the Roman numerals on the reverse side and place them in separate stacks on the table. Shuffle the Goods Tiles face down and place them face up on the Road and Waterway Spaces, one tile per space. In 4-player games, every such space receives a tile (whereas in 2- and 3-player games some spaces remain empty). Sort the remaining Goods Tiles and place them face up on the appropriate spaces of the Goods Market (on the left side of the game board). 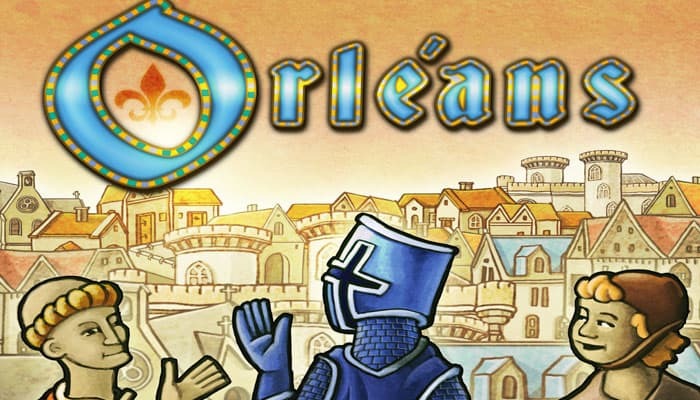 Place your Merchant Token in Orleans. Remove the Followers of the unused player color from the game. 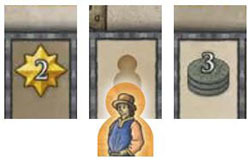 Remove 2 each of the neutral "Farmer", "Boatman", "Craftsman", and "Trader" Character Tiles from the game. Remove 3 each of the "Knight", "Scholar", and "Monk" Character Tiles from the game. Remove 6 Goods Tiles from the game at random. Do not place any Goods Tiles on spaces marked with "4". Those spaces remain empty. Remove the Followers of the unused player colors from the game. 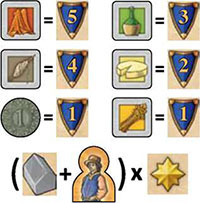 Remove 4 each of the neutral "Farmer", "Boatman", "Craftsman", and "Trader" Character Tiles from the game. Remove 6 each of the "Knight", "Scholar", and "Monk" Character Tiles from the game. Remove 12 Goods Tiles from the game at random. Do not place any Goods Tiles on spaces marked with "3" or "4". Those spaces remain empty. You are trying to achieve dominance in various areas in medieval France. You will get goods, coins, and victory points via production, trade, development, and by committing to the common good. The youngest player receives the Start Player Token. The game is played over 18 rounds, with each round being comprised of 7 phases. Hour Glass: The Start Player draws the topmost Hour Glass Tile from the stack and turns it face up. The Hour Glass Tiles determine the length of the game. The game ends at the end of the round in which the 18th and last tile is drawn. 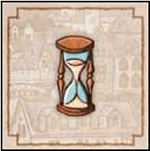 Each Hour Glass Tile also introduces an event that will affect the current round. There are 6 different types of events Except Pilgrimage, events are resolved in Phase 6: "Event". Census: Determine who has the most and who has the least Farmers. The player whose marker is furthest ahead on the Farmers Track receives 1 coin from the supply. If there is a tie, no player receives the coin. The player whose marker is furthest behind on the track must pay 1 coin to the supply. If there is a tie, no player has to pay the coin. Example: The blue player receives a coin and the red player must pay a coin. Please note: In the 2-player game, the player who is behind on the track does not have to pay a coin. The player who is ahead still receives a coin. Followers: Draw Character Tiles from your Followers Bag and place them on the Market. You may draw a number of Character Tiles from your bag equal to or lower than the number indicated by your marker on the Knights Track. At the beginning of the game, this number is 4. Place the drawn tiles on the Market Spaces of your Player Board. You may not draw more tiles than you can fit in your Market. Note: Character Tiles that you do not use remain on your Market, thus taking up space that you might need when drawing tiles. Example: The green player may draw 4 tiles from his bag. The yellow and blue player may each draw 6 tiles, and the red player may even draw 8 tiles from his bag. Planning: You may use the Character Tiles from your Market to activate actions in Places. You may leave Character Tiles on your Market to use them in subsequent rounds. Each Place provides a specific action and requires a certain set of Character Tiles to activate. (Some Place Tiles only require a single tile for activation or none at all). Example: You need a boatman and a craftsman to receive another farmer. Place the required Character Tiles on the corresponding Action Spaces of the Place you want to activate. A Place is considered activated as soon as all of its Action Spaces have a tile. You can carry out the action during the following or during a future Action Phase. You are not required to place all required tiles during the same Planning Phase. You may place some now and the rest in subsequent rounds. As long as you have not placed all of the required tiles, you have not activated the action and may not play it. Actions: You may carry out the actions of the Places you activated, i.e. where you placed a Follower (or Technology Tile) on every required space. Beginning with the Start Player and in clockwise order, each player may carry out 1 action or pass. If you pass, you cannot carry out any more actions during that round. After you played an action, remove the Followers from that action (e.g. the Boatman and the Craftsman from the Farm House) and put them back into your bag. Please note: Technology Tiles remain on the Action Spaces you placed them until the end of the game. You may carry out your actions in any order. You are not required to carry out an activated action. You may pass even if you could carry out more actions. The Action Phase ends when all players have passed. If you pass, you cannot participate in the current Action Phase anymore. Activated actions that you did not use this round remain activated and can be used in a subsequent round. Do not remove Character Tiles from actions you have not used yet. Event: Resolve the event shown on the Hour Glass Tile of this round. (The event affects all players. See below for details on the events). Start Player: The current Start Player passes the Start Player Token to the player to his left. Every Place represents a specific action. Your Player Board features the most common Places. As the game progresses, you can acquire additional Places. You can play an action if it is activated (all spaces occupied). After you played an action, you remove the Character Tiles (but not the Technology Tiles) used to activate it and return them to your Followers Bag. Take a Farmer Tile from the Farm House on the game board and put the Farmer into your bag. Then advance your marker one space on the Farmers Track and receive the depicted good. The position of your marker on this track also plays a role during Phase 2: "Census". Take a Boatman Tile from the game board and put it into your Followers Bag. Then advance one space on the Boatmen Track and receive the depicted number of coins. On the last space of that track, the first player to get there receives a Citizen Tile instead of coins. Take a Craftsman Tile from the game board and put it into your Followers Bag. Then advance one space on the Craftsmen Track and receive a Technology Tile. Put the Technology Tile next to your Player Board. You may only use it after you pass. Technology: You can place the Technology Tile on an Action Space of your choice to replace the required Character Tile for the rest of the game. You do not remove the Technology Tile after you played the action. It remains on its space until the end of the game. The first Technology Tile you place in a game must replace a Farmer. Subsequent Technology Tiles may replace any Character Tile except Monks. Monks can never be replaced with Technology Tiles. You may not place more than 1 Technology Tile at one Place. You may not place a Technology Tile at a Place that only requires a single Character Tile. You may not move a Technology Tile after you placed it. Take a Trader Tile from the game board and put it into your Followers Bag. Then advance one space on the Traders Track and expand your city with a Place Tile. Expanding the City: You may choose a Place Tile. There are two types of Place Tiles, I and II. When you advance on the Traders Track for the first time, you may only choose a tile from stack I. Every other time you advance on the track, you may choose a tile from stack I or II. Place the chosen Place Tile next to your Player Board. You now have another Place you can activate or use its special ability. Note: The players may look through the stacks of Place Tiles at any time. Take a Scholar Tilef rom the game board and put it into your Followers Bag. Then advance one space on the Scholars Track and receive the depicted number of Development Points. For each Development Point you receive during the game, advance your marker one space on the Development Track. Take a Knight Tile from the game board and put it into your Followers Bag. Then advance one space on the Knights Track. The Knights Track indicates how many Followers you may draw from your bag and place on your Market in Phase 3. At the beginning of the game, you may draw 4 Followers each round. You can increase this number by recruiting Knights. Note: When you get your fourth Knight, this number (7) does not increase, but you may receive a Citizen Tile if you are the first player to get there. Note: Once your marker moves onto the last space of a track, you may no longer take the corresponding action. Take a Monk Tile from the game board and put it into your Followers Bag. There is no additional bonus like with the other actions. Monks can be used in place of any of the other Character Tiles. (However, the inverse is not true. You cannot use another Character Tile or a Technology Tile in place of a Monk). Move your Merchant Token from its current location along a Waterway (blue connection) to an adjacent town. If there is a Goods Tile on the way, you may take it. If there are multiple goods, you may take one of them. Place the Goods Tile next to your Player Board. 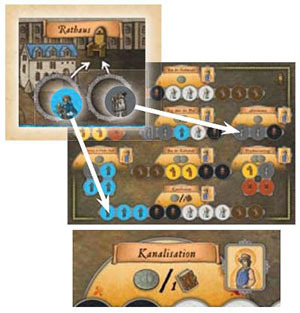 This action is similar to the "Ship" action, but rather than moving along a Waterway, move your Merchant Token along a Road (brown connection). Build a Trading Station in the town in which your Merchant Token is present if there is no Trading Station in that town already (regardless of which player it belongs to). Each town can only have one Trading Station. 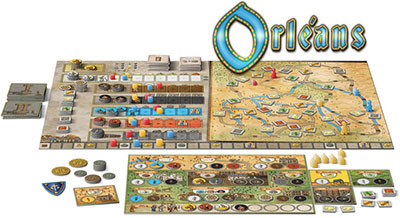 Exception: In Orleans, each player may build one Trading Station. You receive 1 Development Point. Advance your marker one space on the Development Track. During the Planning Phase, you can place 1 or 2 Character Tiles in the Town Hall. (The Town Hall does not require both spaces be occupied in order to activate). When using the "Town Hall" action, move one or both Character Tiles from the Town Hall to any free appropriate spaces on the "Beneficial Deeds" board. You receive the depicted reward (1, 2, or 3 coins, and in case of Canalization 1 coin or 1 Development Point) for each character. When you complete a Beneficial Deed (i.e. you place a tile on the last remaining unoccupied space), you receive the Citizen Tile of that Beneficial Deed. You cannot replace the Character Tiles required for Beneficial Deeds with other tiles (like Monks). You must always use the exact Character Tiles as shown on the spaces. Character Tiles used for Beneficial Deeds remain there for the rest of the game. Please note: You may not place the Followers of your color (i.e. your initial Farmer, Boatman, Craftsman, and Trader) in the Town Hall. Some spaces of the Development Track show coins or contain a Citizen Tile. If you move your marker onto or past a space with coins, you receive the depicted amount of coins from the supply. If you are the first player to move onto or past a space with a Citizen Tile, you receive that tile. Development Status Spaces indicate your state of development. If you move onto or past such a space, your Development Status immediately becomes the depicted value. At the beginning of the game, this value is 1. Note: Your Development Status affects the "Income" event (you receive a number of coins equal to your Development Status), the Hospital, as well as the victory point value of your Citizen Tiles and Trading Stations at the end of the game. Trading Stations and Citizen Tiles: Each Trading Station you have built and every Citizen Tile you have collected is worth a number of VP equal to your Development Status. The player with the most VP wins. In case of a tie, the player further ahead on the Development Track wins. If still tied, there are multiple winners. (Example: Klemens has built 5 Trading Stations and collected 2 Citizen Tiles. His current Development Status is 4, as indicated by the Development Track. He receives (5+2) x 4 = 28 VP). You may replace missing coins with any mix of items from this list (e.g. if you owe 5 coins, you may replace them with 1 Follower, 2 Trading Stations, and 2 Development Points). All items lost in this process are removed from the game. Only Development Points can be re-gained. Character, Technology, and Goods Tiles are limited in this game. You cannot gain a tile if it is not available anymore. When you run out of a particular tile, you can no longer play an action that provides that tile. Events may result in certain tiles becoming available again (Harvest, Plague). When this happens, you can play the corresponding actions again. When there are not enough coins in the supply (temporarily), players cannot receive coins (at the moment). At any time during the game, you may look into your bag to see how many and which Followers you have in there. (When you fi nish looking, shuffl e the tiles in your bag so that you cannot draw particular tiles on purpose). You may use empty Roads and Waterways. You just do not receive a good. The marked Followers of your color (which you received during setup) always remain with you (either in your bag or on your board). You cannot use them for Beneficial Deeds nor lose them to the Plague nor pay with them during Torture. You cannot move a Character Tile from one Action Space to another. However, when drawing Followers from your bag during Phase 3: "Followers", for each Follower that you decline to draw, you may move a Character Tile from an Action Space to your Market. (Example: Stefan may draw 6 Followers. He only draws 4 Followers and moves 2 Followers from Action Spaces to his Market). Pay coins into the general supply and take coins from there when you receive them. Most phases can be played simultaneously. In Phase 4 (Planning), start planning at the same time. Then tell the other players when you are done planning. If need be, do this in turn order, i.e. beginning with the Start Player and in clockwise order. Likewise, resolve payments in that same order.